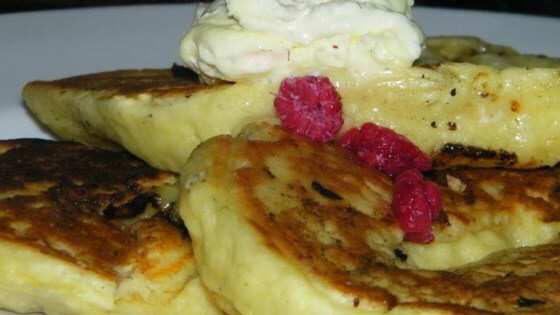 "These banana pancakes have a delicious new twist! White chocolate chips give these pancakes an intense flavor rush spiced with cinnamon, ginger, and vanilla. Using a boxed pancake mix make these super easy to make, but so delicious people will be begging for the recipe!" Whisk together eggs, milk, vanilla extract, cinnamon, and ginger in a bowl until smooth. Stir in the baking mix until moistened, then add the bananas and chocolate chips, and stir to mix. Heat a lightly oiled griddle or frying pan over medium heat. Pour or scoop the batter onto the griddle, using approximately 1/4 cup for each pancake. Flip over once bubbles appear on the top. Cook until browned on the other side. Serve hot. I added flax seeds instead of the banana. It was okay but I ommited the chips after a couple of recipes since they were just additional sugar. So YUMMY!! Very good. I wouldn't change a thing! I made this recipe without choc. chips and it still was awesome. I mashed bananas instead of slicing. The bananas added just enough sweetness for breakfast pancakes. Absolutely LOVE these things. Anytime I make these, they're sure to be gone in a flash! sooo delicious! I only made half the recipe and will be making this one again and again!